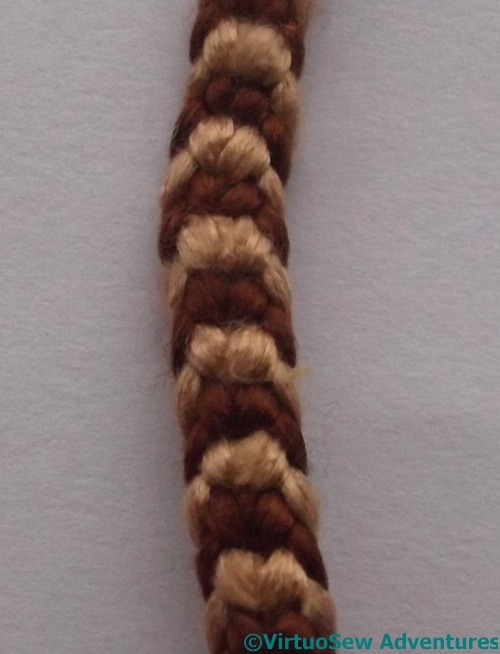 There were so many intrigued comments about my Marudai and the braids it made, that I thought I would show you some more of the braids I’ve made. Kumihimo is a traditional Japanese technique. 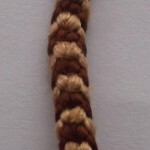 The braids have a lot of traditional uses in Japan – in fact, an opera singer friend of mine tells me his Samurai costume for his part in a brand-new opera about a crucial part of Japanese history was correct down to properly made kumihimo braids in all the right places! 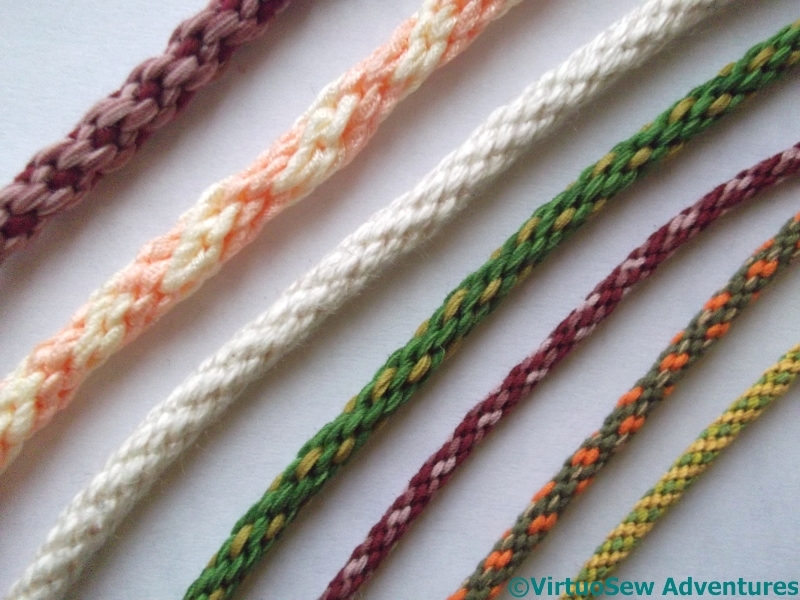 If you search for Kumihimo on eBay, what you will find, by and large, are bracelets. Now, I’m really not a bracelet sort of girl. I have a few chunky, “statement” bangles, which are worn specifically, explicitly and only when I’m planning nothing more strenuous than lifting a knife and fork. 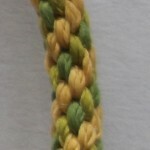 Cord bracelets – no. However, I do have a lot of heavy, dramatic pendants, and the idea of making cords to point up the colours in the pendants – yes, definitely. 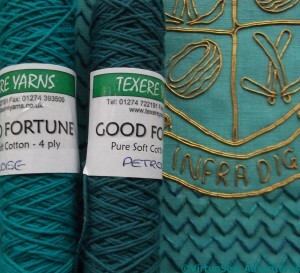 I’ve found that sewing machine thread makes a wonderful material for these purposes – it comes in a huge range of colours, and it’s fine, supple and strong. 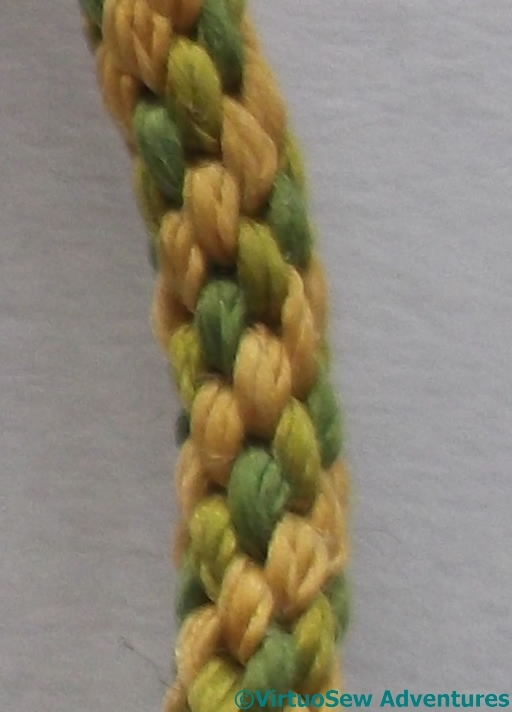 It also lends itself well to heathering – combining several colours in a single strand – and best of all, it’s relatively inexpensive. 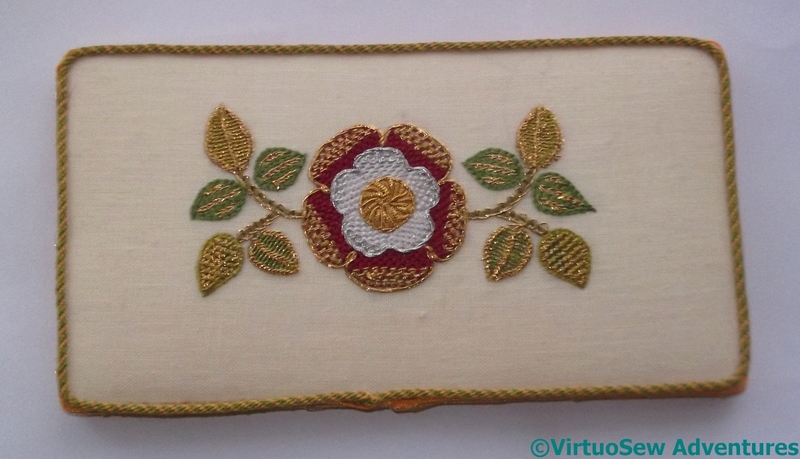 The fine green and gold cord is silk, made using some of the thread from the Tudor Rose kit – I used it to trim the Tudor Rose panel. The next three, and the top, chunky pinky-maroon, are all necklace cords made using sewing machine cotton, although the maroon mookaite pendant I made the two maroon ones for has spurned both of them with scorn. 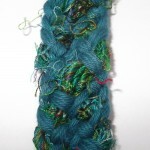 I’ll try again, because I enjoy kumihimo. The white one is silk, to go with a pearl-mounted enamelled cross pendant given to me by an old family friend, and which I wore on my wedding day. 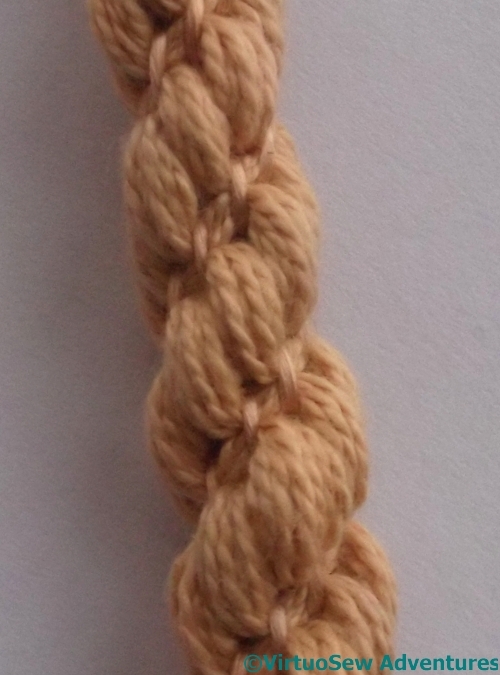 The cord I used then has become grubby over the years, so this one will see me through a few more. 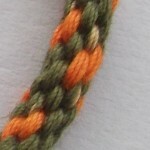 The cream and peach usually carries a glass pendant. 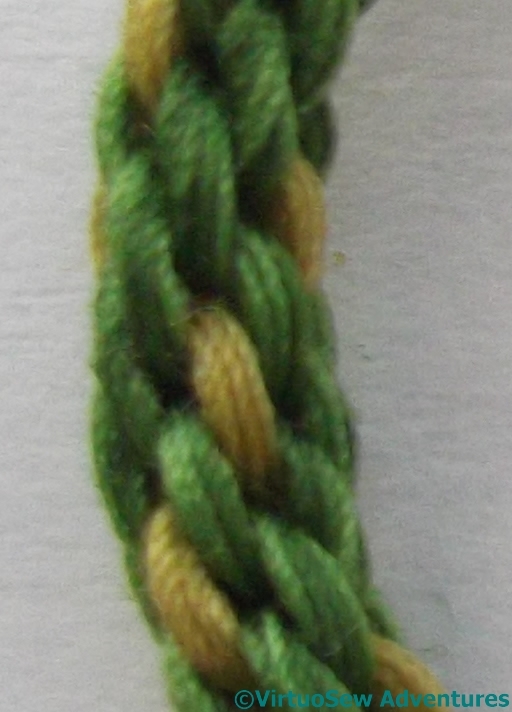 It’s one of two I’ve tried for that pendant, in fact – but this “making things match” is never quite as easy as we hope, is it! 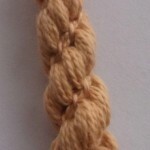 The round apricot rope is huge – about for or five times the size of the other round cords I’ve done. I might mount it with cord ends and turn it into a choker one of these days.. 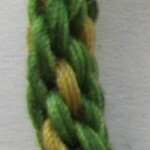 The stripy one is a fairly fine flat braid in filament silk. 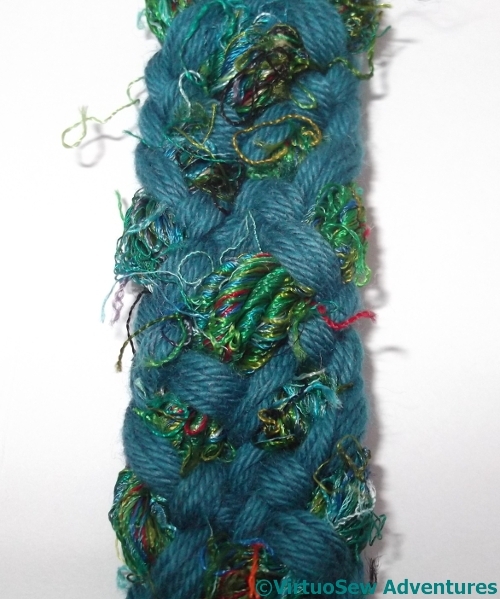 I worked this one as an experiment, changing the tension (more or less weight on the end) to see what effect it would have. In the end I came to the conclusion I wasn’t being dramatic enough with my experiments! These flat braids were given extra texture with saree silk knitting yarns. Again, they tell me that some of my experimentation needs to be a bit more dramatic. 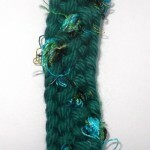 I was hoping to emphasize the different textures, but used too many strands of the cotton yarn, so there wasn’t enough difference between the strands. 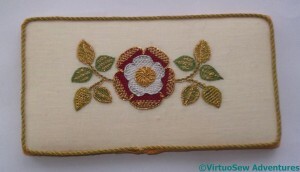 At long last I got a chance to finish up and turn the Tudor Rose into a little mounted panel. I got a local framing shop to cut me two pieces of acid free mount board, and mounted it over one of them, with a little padding to bring it to life. 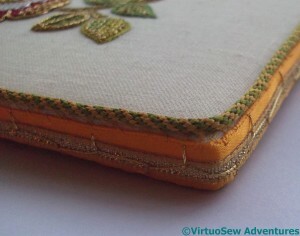 Then I covered the other (also with wadding) with some upholstery fabric that happened to be to hand, and overstitched the two boards together. I covered the overstitching with a ribbon trim left over from when I finally mounted Christus Natus Est (whoo-hoo, some stash busting achieved!) 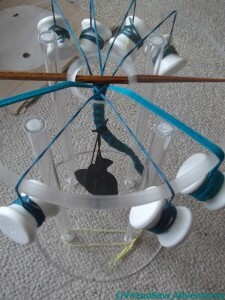 and then, at some length and not without difficulty, attached a fine kumihimo cord around the front edge of the panel to frame it nicely. It will go in that famed (and so far, still mythological) Winter Decoration Corner that I keep on talking about – when I finally create it. 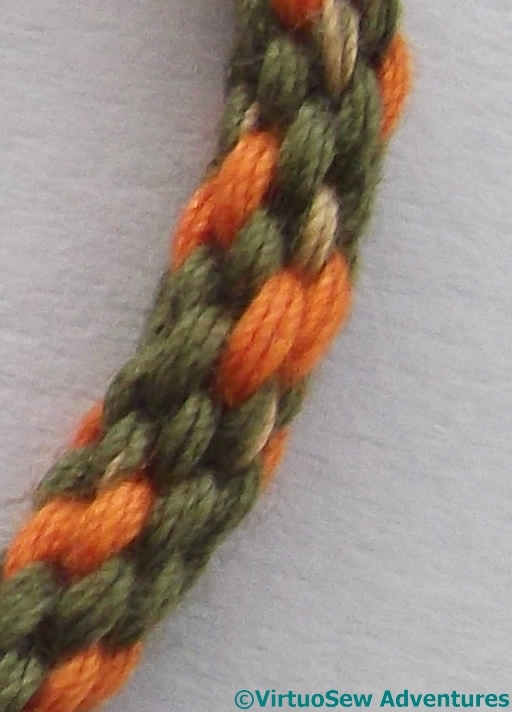 I’ve been fascinated by Kumihimo braiding for ages. I first heard about it many years ago from a mathematician friend of my husband’s. Quite why, I can’t now recall, unless it was a desperate attempt on the part of the mathematician to find something textile-related to talk to me about. Jolly decent of him, don’t you think? He certainly had no idea what he was starting.. Anyway, I’ve heard a lot about it, and rather like the effects that can be obtained. In the UK, the best source for information and equipment is Jacquie Carey at The Carey Company. Jacquie has also become better known to historical embroiderers because while she was researching historical braids she became fascinated by the stitches in them, and besides her books on Braiding, she has now written books about Elizabethan Stitches (remember my experiments with some of them for the Glittering Nightcap? ), and Sweet Bags! I’ve bought myself an acrylic marudai and bobbins, and spent a fascinating – not to say, bewildering! 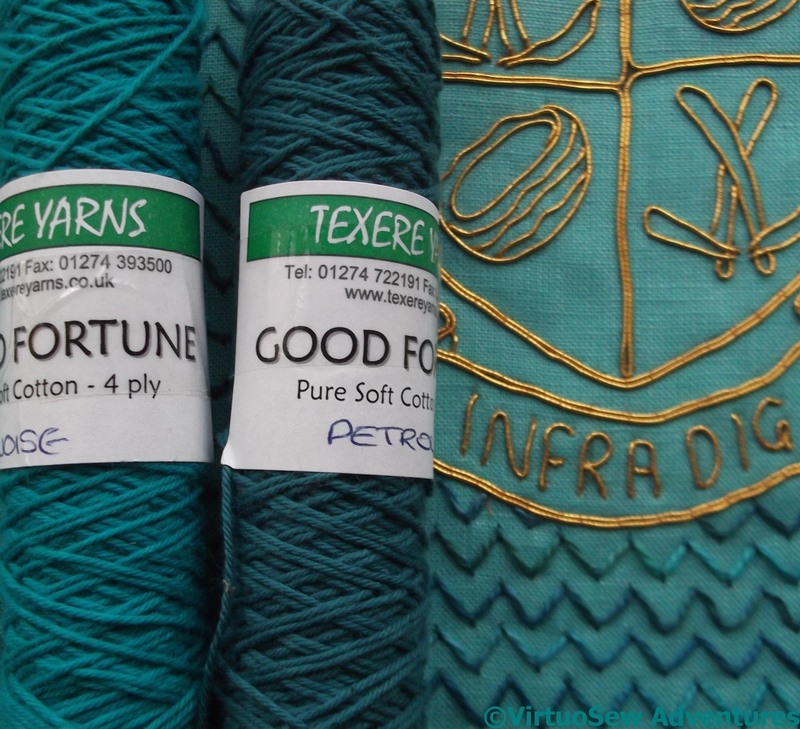 – couple of hours at Texere Yarns in Bradford, trying to find some suitable yarns to experiment with. 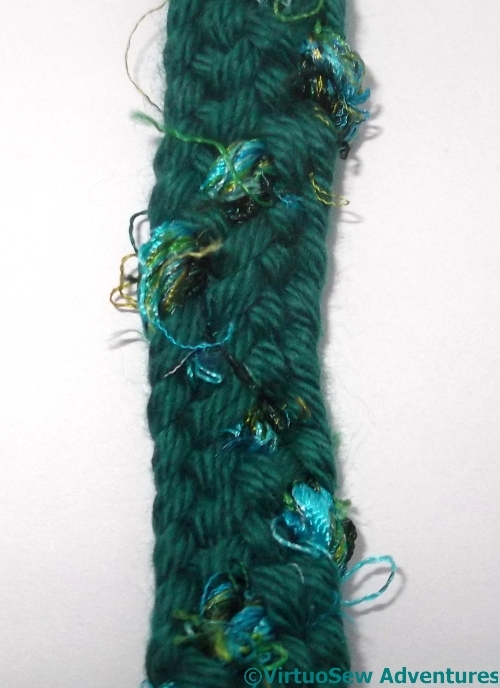 Since my initial aim is to create a braid edging for the Crest for the Dig, I began by finding some cotton knitting yarns that seem to go very nicely with the panels, as well as a whole load of extra yarns for additional experiments.